PowerPoint is a great program to use when you are doing training presentations. I use it myself. It has a few problems, though, that we can solve with training flipcharts printed in our shop and laminated with plastic. First of all, one session after the other with the lights out can get a little tedious. Mix it up! Turn the lights on and do a section of your training with a large format flipchart presentation. Everyone will perk up. While the technology has gotten much more reliable over time, you still need to have a laptop, a projector, and all the paraphernalia that goes with them working right. Presentation flipcharts always work! They don’t need power either. Finally, it’s sometimes easier to interract with a flipchart. You can write on them with a dry erase marker, walk right up to them and point, etc. Flipcharts are best for presentation material that doesn’t change a lot. It is cheaper to change electronic versions! Prices get lower the more you buy, so do 25 or more at a time if you can. 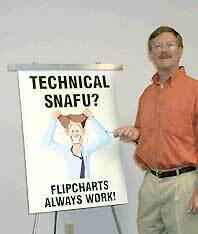 You can buy the flipchart holders at any office supply chain store. This entry was posted in large format printing and tagged flipcharts for training, presentation flipcharts, training flipcharts. Bookmark the permalink.